July 13, 2016 | Our brothers and sisters over at Local 570 are sponsoring an American Red Cross blood drive Sunday, July 17th, 10 am to 3:30 pm at their union hall – 6910 Eastern Ave., Baltimore, MD 21224. Let's help out and do our part to prevent a summer shortage. To schedule your life-saving donation, visit redcross.org and enter sponsor code: teamsterblood. (Additional details here.) See you there! July 25, 2016 | The Baltimore health commissioner is urging residents to prepare for 100-degree heat on Monday that could pose dangers for the young and elderly. The temperature is forecast to reach as high as 100 degrees, but it could feel as hot as 109 with humidity and wind factored in, according to the National Weather Service… baltimoresun.com Read the Teamster fact sheet on heat stress. July 25, 2016 | (Click image to enlarge.) 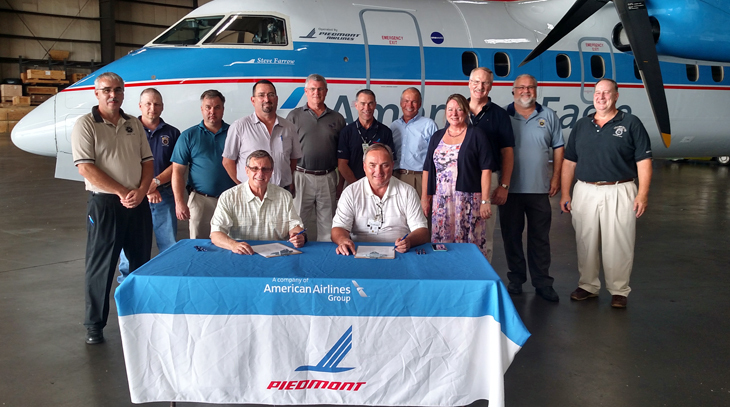 Approximately 300 Piedmont Airlines mechanics from Teamsters Locals 210, 355 and 776 have voted overwhelmingly to ratify a five-year contract with the carrier. More than 83 percent of voting mechanics cast their ballots in favor of the agreement. The agreement was reached May 26 and contains a 7 percent signing bonus and a 13 percent wage increase over the life of the agreement. Job security and furlough language are also vastly improved… teamster.org Photo: Second from left, shop steward Corey Lopatofsky, and far right, Local 355 Business Agent John Caparatta and Stephen Kennedy, shop steward and Piedmont Airlines dispatcher. July 27, 2016 | After long and difficult negotiations, the Teamsters National Automobile Transporters Industry Negotiating Committee (TNATINC) has reached a tentative national Carhaul agreement with the National Automobile Transporters Labor Division (NATLD), the multi-employer collective bargaining association representing the unionized sector of the vehicle transport and logistics industry. The National Union Bargaining Committee has fully endorsed this new tentative settlement and believes it meets the goals of the carhaul membership and provides for their long-term job security. Details of the tentative agreement will be announced when leaders from local unions meet to review the proposal on August 4. Stay tuned here.